Losing one’s sight is no walk in the park and I think it’s safe to say that no one would argue this point. In fact, many sighted people probably would consider it a curse. I know the younger me certainly thought so. When I was 13, I was diagnosed with Usher Syndrome. This diagnosis explained my congenital moderate to severe hearing loss, something that was no big deal to me. In fact, I have embraced my deafness as a beautiful gift. A blessing. I enjoy being a part of two unique worlds: the deaf and hearing. I also love being able to turn off my hearing aids to shut out annoying sounds, like the roar of a vacuum, or when I just need some peace and quiet. But the diagnosis also revealed something else. Something that was looming on the horizon: I was slowly going blind. Blind? How? Why? I could not see any good coming from my impending gradual sight loss. No, this was a curse. Virginia straddling the equator in Uganda. My vision has now progressed to the point where I am deemed legally blind due to no peripheral vision. And though it has been difficult adjusting to my ever-changing sight, I no longer view it as a curse. and of course the many friends I’ve met all along the way. I can confidently say that I have lived a fulfilled and satisfying life and I plan to continue to live a joy-filled life even when and if my vision completely fades away. Blindness does not have to be a curse. No struggle or trial has to be viewed as a curse. In fact, it will only a curse if you make it one. The trials we face are real, but it’s important to take a step back and find the blessings among them. They are there, even if they are small. 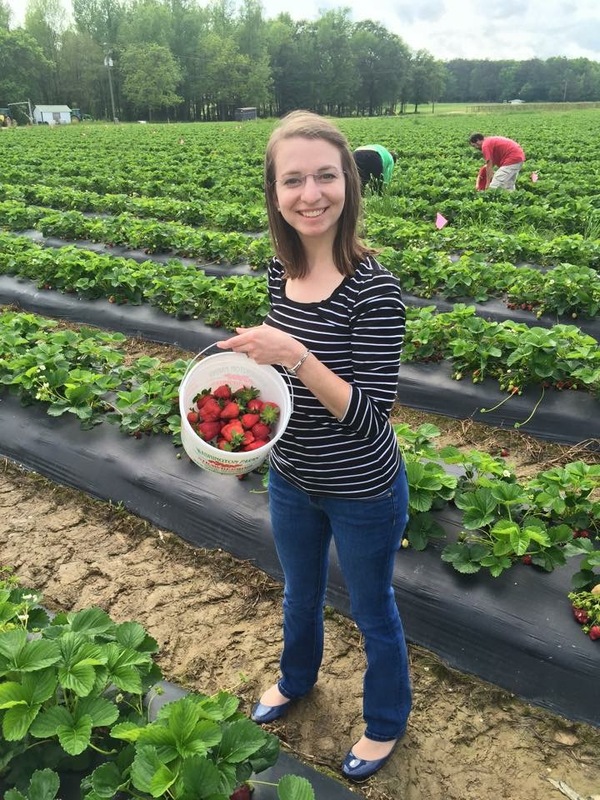 Photo of Virginia at a strawberry picking farm. She is standing in a field of strawberries holding a bucket of the fruit. Virginia is casually dressed in blue jeans, navy ballet flats, and a navy & white striped long-sleeved, scoop neck tee. Thank you Albert! This is one of my favorite parts of blogging because my life has been so enriched by these remarkable people. It’s such a joy to share their words with the world. Virginia is a lovely woman! Awe thanks Camie, I will let her know.